After faire, Meg was hanging out in our room, watching a cartoon. I asked if she had fun today, and she said it was great. In between words, I noticed strange things were afoot. "Meg, stick out your tongue." And this is what I get. 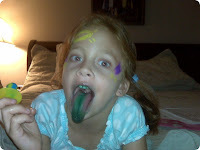 My aardvark and her green tongue.